The other day I was at Pondicheri, one of my favorite Houston spots and was checking out the merchandise in their new(ish) upstairs bake lab. 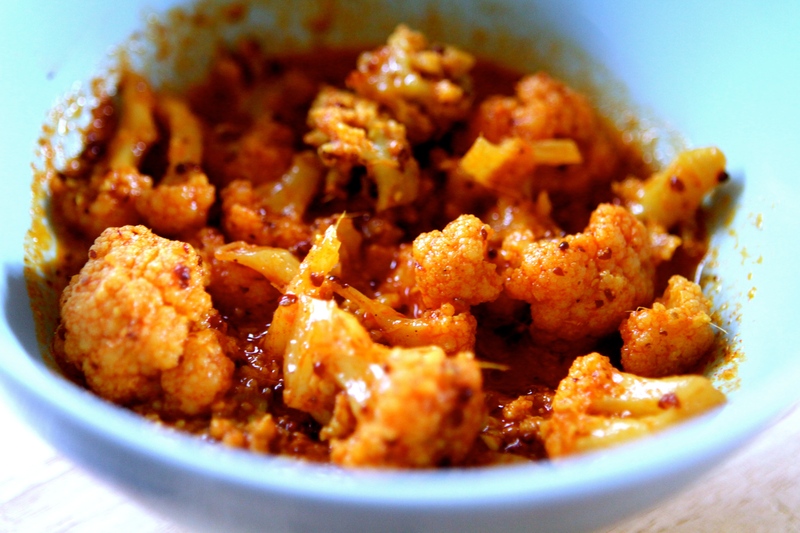 I spotted a jar of cauliflower pickles out for sample, and tried one…or two. They were spicy, sweet, tangy and perfectly crunchy, punctuated by black mustard seeds and a variety of Indian spices, some familiar and some not so much. They were so freaking good. Instead of buying a jar and calling it a day like any normal person might, I set out on a mission to make my own. After snapping a shot of the ingredient label, I sent my wonderful boyfriend out to the Indian market to buy the less common ingredients. These pickles call for mustard oil, which was new to me. It is hot and obviously very mustardy, so I’d recommend tasting this as you go, adding more or less of the ingredients to your preference. They also call for jaggery, which is unrefined palm sugar and has a more molasses-like flavor than regular sugar. You can substitute coconut palm sugar if you can’t find it. I had some Romanesco cauliflower (that’s the green, alien-like one in the picture) from the farmer’s market so I threw that in as well. This recipe should make two mason jars full, plus enough liquid to cover all of the pickles, and they should stay good for months in the refrigerator. If you are a canner, you could certainly seal these in a water bath. I just know mine aren’t going to last that long! On a further note, I posted another Indian-inspired condiment recipe on Ali Miller RD, my Crunchy Spiced Chickpeas! I’ll be blogging for Ali twice a week, so you’ll have double the recipes each week! Check out her Houston based Food As Medicine practice here. First, blanch the cauliflower. Bring eight cups of water to a boil, then blanch 2-3 minutes. Drain well and spread out on paper towels to dry. Place the ginger and garlic in a food processor or blender and pulse until a smooth paste is created. You want to take the stringiness out of the ginger. Set aside. Toast the mustard seeds in a small skillet over medium heat until they begin to top. Be careful, because they like to jump right out of the pan! Transfer to a mortar and pestle and crush roughly, or use the bottom of a glass to crack them. Place the jaggery and vinegar in a small saucepan and stir over medium heat until all of the jaggery has dissolved. Lower the heat and simmer. In another pan, add the mustard and olive oil and heat until just below smoking. Lower the heat and add in the ginger and garlic paste and cook, stirring intermittently for 5 minutes. Add all of the rest of the spices and the salt, then add the jaggery and vinegar solution and simmer, stirring, for another 5 minutes. 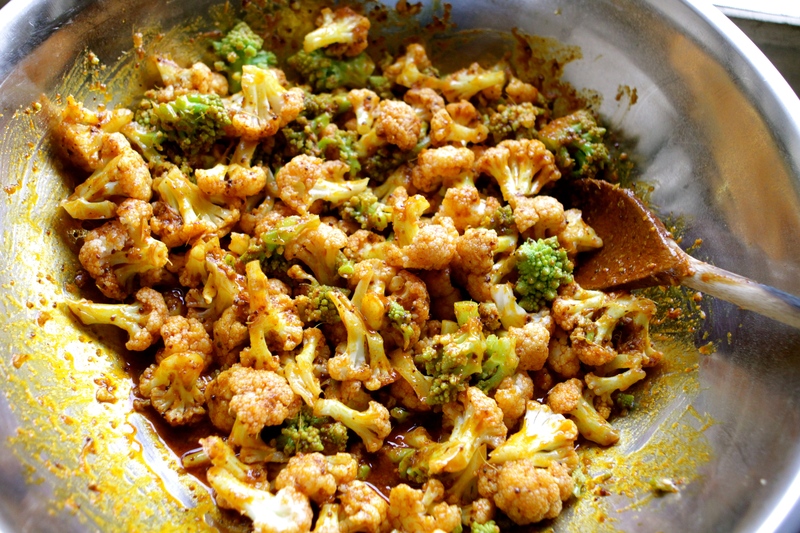 Allow the mixture to cool about 15 to 20 minutes so it will not cook the cauliflower any further. Then, in a large bowl, pour the liquid over the cauliflower and mix until all of the pieces are evenly coated. Spoon into sterilized mason jars and fill up to the top with the sauce, then cover tightly with a lid. Allow to sit at room temperature for two to three days. Transfer to the refrigerator and enjoy as a condiment, on salads or straight out of the jar!